It’s the return of my Hello Kitty umbrella! I apologize for this overflowing display of cutesy a.k.a. pacute. I swear if I had another pink umbrella without Hello Kitty and flowers on it, I’d use that instead of this. Unfortunately I don’t, so this semi-decent pink Hello Kitty umbrella will have to do for now. Bear with me, people! Even though it’s been raining cats and dogs here in Manila, no amount of rain can dampen my sunshiny mood! I’m dressed as if the sun is shining like there’s no tomorrow! Gloomy weather? What gloomy weather? I’m fighting back with a colorful ensemble that reminds me of lego and children’s playhouses. And we all know no one gets sad over the thought of lego and playhouses! If you do, then Sigmund, we’ve got a problem. Primadonna shoes are seriously one of the most comfortable shoes out there!!! YES! You read that right! I have a gadget accessory on! 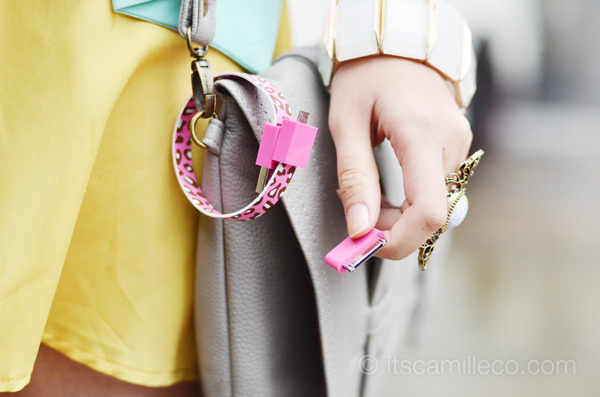 Who would’ve thought that this pink leopard print thing is not a bracelet? Like other cable accessories, the Mohzy Loop provides data transfer and battery charging for all Micro USB devices such as smartphones, mp3 players, bluetooth, and GPS devices. It also comes with an officially licensed Apple Adapter that allows you to charge your Apple products such as iPhones, iPods, and iPads. The Loop micro USB & iPhone/iPod cable from Mohzy combines fashion and utility into 1 simple product for most Apple iPhones/iPods, Android smartphones, and Blackberry devices. The hidden magnets inside the cable allow you to clip its 2 ends together to form a wristband like how I wore it or you can simply attach it to your bag like in the photo above. 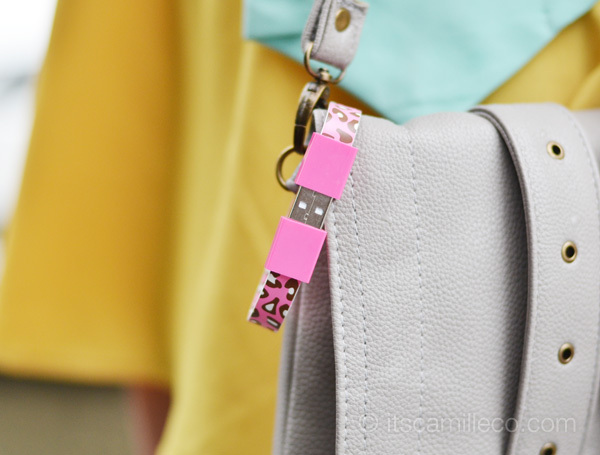 You can also clip the cable onto any metallic surface like a cubicle wall, computer tower, or fridge and use it to hang notes and photos with ease! Convenient right? 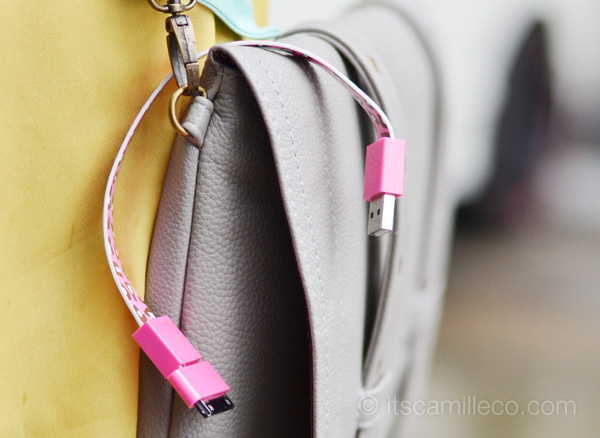 And because the Mohzy Loop has a flat profile unlike other cables, it allows for easy storage in your purse without having to worry about it getting tangled in with all your other stuff. Hassle-free! If you want to get one for yourself, the Mohzy Loop is available in a variety of colors and patterns at Beyond The Box, Digital Hub, Digital Walker, E-Central Electronics, EDS, Gui, iBook, iCenter, iGig, iStudio, MSY Data Venture, Podworx, Powerhub, Power Mac Center, Sidrah, SKT Digital, Technoholics and The Inbox Store. I just discovered you through a post on HelloCotton =) Absolutely going to follow you! Jealous of the heels, they’re great! oh. the HK umbie is back!!! :”> hihi. that`s okay. I love it. haha. I really like how you play with colors. and I learned to do it already. :P thanks to you! I had to google what bdj is haha thanks! Thanks Anaivillo! Yummy candy! Haha! You honestly have the best shoes. What I wouldn’t do to have a peek at your shoe collection. i love the optimistic side you did on that very gloomy day.. two thumbs up for that..^^ plus i super like your hello kitty umbrella..
this outfit is like a chic, super cute macaron! and keep using your cutesy Hello Kitty umbrella. :D You could even sport some Hello Kitty ears and you’d still look sophisticated. hi.. how do you edit photos? what iphone pplication or program do u use? can i have your hello kitty umbrella if you get a new pink umbrella? Awwwww this is soooooo cute! well, you definitely brighten that rainy day!!! 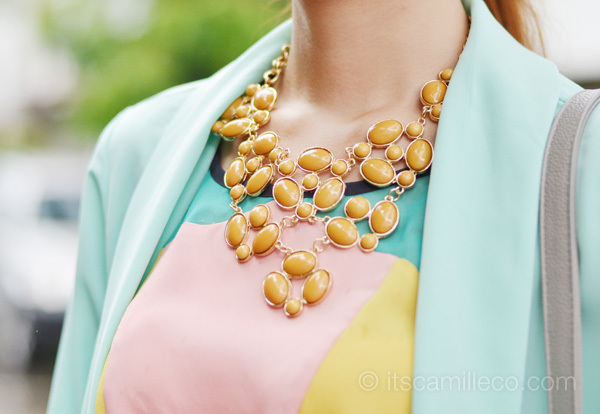 in love with the pastel colors! Pretty as always. I might want to go to SM and buy that necklace of yours :) very nice. Nice colors and also I love your bag!! Your bag is undeniably inspired by Proenza Schouler. Do you own any? Would love to see you carry a ps1 or ps11 one day! I don’t! I think they’re so pretty though! I do agree that they’re so comfy! Hahaha I doubt hello kitty is all that happy in the rain haha!